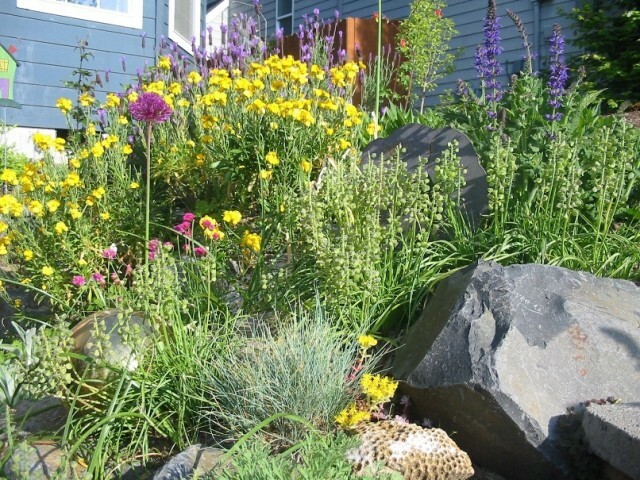 We design our gardens for beauty, nourishment, drought-tolerance, to warm or cool our homes, and to increase property value. Why not also design to support beneficial insects? Gardening to support beneficial insects benefits the planet and the gardener. Beneficial insects – considered helpful because they are desirable to humans – improve pollination of fruits, vegetables and flowers. But perhaps most importantly for the home gardener, they help keep in check populations of aphids, mites, scale and other insects that damage the plants we love. Nurturing beneficial insects isn’t a quick-fix – it can take months for populations of the "good bugs" to build up, and you have to learn to tolerate a certain number of "bad bugs" (the ones that eat your plants), since, after all, they support the beneficial insects. Furthermore, sometimes you have to look more deeply at whether plants you grow are healthy. Unhealthy plants – stressed by receiving too much or too little light, water or nutrients – will continue to have problems, no matter how many beneficial insects you attract to your garden. But by providing good insect habitat in your garden, you’re supporting beneficial insect conservation, and also helping birds that feed on insects. It’s win-win for everybody. The best part is, you’re just growing flowers to do it! I’m all for beautiful new hybrid flowers and enjoy some new coneflower, cosmos and other hybrids in my own garden. But when it comes to pollinating insects, old-fashioned varieties are the best, according to the Xerces Society’s Matthew Shepherd. "In the process of trying to create new colors or double blossoms, breeders sometimes breed the pollen out of plants," he says. "Sometimes it’s by chance, sometimes it’s intentional, as with plants that are bred for not attracting bees," says Shepherd. It’s one thing if you’re allergic to bees, or scared of them. But for the rest of us, bees are an important part of garden ecology and attracting them, and other pollinators, is desirable. What kinds of plants should we look for? "When at the garden center, look to see where the bees are. And buy those plants!" In addition to seeking out heirloom varieties that are often richest in pollen, Shepherd suggests seeking out native plants to attract native pollinators and going for culinary herbs, which haven’t been bred for flower color or size. "They aren’t developed as garden blooms, so they’re more likely to be rich in pollen," he says. Felton, California seed company Renee’s Seeds provides excellent resources and information – click on "attract beneficial insects" for an excellent introduction to the various bugs that are found in gardens, and how to support them with your plantings. You can also find seeds and wildflower seed mixes specifically designed to nurture pollinating insects. Dig into the Xerces Society website for great information on supporting pollinating insects in the garden. Visit their Pollinator Conservation Resource Center for more information. And learn more by ordering the Xerces Society’s staff-authored volume Attracting Native Pollinators on the website.